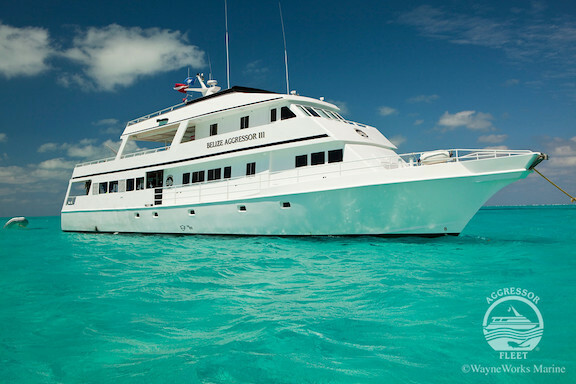 Join Aqua Hut's Jeff Davis and travel to Belize aboard the Belize Aggressor live-a-board dive boat. Belize is a wall diver's paradise. Sheer walls like Painted Wall, Half Moon Caye Wall and Quebrada are adorned with huge crimson gorgonians and giant orange elephant ear sponges. Moray eels, spiny lobsters and tiny arrow crabs hide in every crack, crevice, cave and tunnels of these beautiful coral formations. These are just a few things you will see at Lighthouse Reef, Half Moon Cay and Turneffe Reef. Every Saturday at 6 pm, the luxurious BELIZE AGGRESSOR III™ casts off from the Radisson Ft. George dock for liveaboard scuba diving, located in the heart of downtown Belize City for a week of hassle-free diving to Lighthouse Reef, Half Moon Cay and the famous Blue Hole. The mystical Blue Hole, a collapsed freshwater cave system is approximately 1000 feet across and over 400 feet deep. The Blue Hole was made famous by ocean pioneer Jacques-Yves Cousteau who declared it one of the Top Ten Dive Sites in the World. In 1971, he brought his ship, the Calypso, to the Blue Hole to chart its depths. Once descended into the Blue Hole guests will see beautiful vertical stalactite formations. Belize liveaboard scuba diving begins Sunday morning and ends Friday before lunch when the BELIZE AGGRESSOR III™ returns to port. Sunday through Thursday there is unlimited diving throughout the day and a night dive each evening. Friday a half day of diving is offered. A trip to this Central American paradise isn’t complete without a visit to Belize’s Mayan ruins, a cave tubing ride through the jungle, or a canopy tour through the tree tops. Tours are offered on Friday afternoon, but an extended stay is recommended to fully enjoy the wonders of Belize and its corner of the Caribbean. Guests may enjoy the Radisson Ft. George Hotel pool and bar area free of charge on Saturday. Taxes and Fees Each guest must pay a $95 USD port fee (2017) and $110 (2018) $158 (10 nights) (includes cruising tax, park fee) at the end of the charter when settling your bill. These may be paid by Visa, MC, USD or BZ cash. Cost Deluxe $3095 per person (8 rooms) Master $3295 per person (1 room). Nitrox extra charge.